"Network card" redirects here. For the British Rail discount card, see Network Railcard. Not to be confused with network interface device. 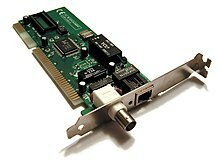 A 1990s Ethernet network interface controller card that connects to the motherboard via the now-obsolete ISA bus. This combination card features both a BNC connector (left) for use in (now obsolete) 10BASE2 networks and an 8P8C connector (right) for use in 10BASE-T networks. The network controller implements the electronic circuitry required to communicate using a specific physical layer and data link layer standard such as Ethernet or Wi-Fi. [a] This provides a base for a full network protocol stack, allowing communication among computers on the same local area network (LAN) and large-scale network communications through routable protocols, such as Internet Protocol (IP). The NIC allows computers to communicate over a computer network, either by using cables or wirelessly. The NIC is both a physical layer and data link layer device, as it provides physical access to a networking medium and, for IEEE 802 and similar networks, provides a low-level addressing system through the use of MAC addresses that are uniquely assigned to network interfaces. 12 early ISA 8 bit and 16 bit PC network cards. The lower right-most card is an early wireless network card, and the central card with partial beige plastic cover is a PSTN modem. Network controllers were originally implemented as expansion cards that plugged into a computer bus. The low cost and ubiquity of the Ethernet standard means that most new computers have a network interface controller built into the motherboard. Newer server motherboards may have multiple network interfaces built-in. The Ethernet capabilities are either integrated into the motherboard chipset or implemented via a low-cost dedicated Ethernet chip. A separate network card is typically no longer required unless additional independent network connections are needed or some non-Ethernet type of network is used. A general trend in computer hardware is towards integrating the various components of systems on a chip, and this is also applied to network interface cards. An Ethernet network controller typically has an 8P8C socket where the network cable is connected. Older NICs also supplied BNC, or AUI connections. Ethernet network controllers typically support 10 Mbit/s Ethernet, 100 Mbit/s Ethernet, and 1000 Mbit/s Ethernet varieties. Such controllers are designated as 10/100/1000, meaning that they can support data rates of 10, 100 or 1000 Mbit/s. 10 Gigabit Ethernet NICs are also available, and, as of November 2014[update], are beginning to be available on computer motherboards. Modular designs like SFP and SFP+ are highly popular, especially for fiber-optic communication. These define a standard receptacle for media-dependent transceivers, so users can easily adapt the network interface to their needs. LEDs adjacent to or integrated into the network connector inform the user of whether the network is connected, and when data activity occurs. Interrupt-driven I/O is where the peripheral alerts the CPU that it is ready to transfer data. Programmed input/output, where the CPU moves the data to or from the NIC to memory. Direct memory access (DMA), where a device other than the CPU assumes control of the system bus to move data to or from the NIC to memory. This removes load from the CPU but requires more logic on the card. In addition, a packet buffer on the NIC may not be required and latency can be reduced. Multiqueue NICs provide multiple transmit and receive queues, allowing packets received by the NIC to be assigned to one of its receive queues. The NIC may distribute incoming traffic between the receive queues using a hash function. Each receive queue is assigned to a separate interrupt; by routing each of those interrupts to different CPUs or CPU cores, processing of the interrupt requests triggered by the network traffic received by a single NIC can be distributed improving performance. With multi-queue NICs, additional performance improvements can be achieved by distributing outgoing traffic among different transmit queues. By assigning different transmit queues to different CPUs or CPU cores, internal operating system contentions can be avoided. This approach is usually referred to as transmit packet steering (XPS). Accessing local and remote memory without involving the remote CPU. Accessing local and remote I/O devices without involving local/remote CPU. This capability is supported by device-to-device communication over the I/O bus, present in switched-based I/O interconnects. Controlling access to local resources such as control registers and memory. Some products feature NIC partitioning (NPAR, also known as port partitioning) that uses SR-IOV to divide a single 10 Gigabit Ethernet NIC into multiple discrete virtual NICs with dedicated bandwidth, which are presented to the firmware and operating system as separate PCI device functions. TCP offload engine is a technology used in some NICs to offload processing of the entire TCP/IP stack to the network controller. It is primarily used with high-speed network interfaces, such as Gigabit Ethernet and 10 Gigabit Ethernet, for which the processing overhead of the network stack becomes significant. Some NICs offer integrated field-programmable gate arrays (FPGAs) for user-programmable processing of network traffic before it reaches the host computer, allowing for significantly reduced latencies in time-sensitive workloads. Moreover, some NICs offer complete low-latency TCP/IP stacks running on integrated FPGAs in combination with userspace libraries that intercept networking operations usually performed by the operating system kernel; Solarflare's open-source OpenOnload network stack that runs on Linux is an example. This kind of functionality is usually referred to as user-level networking. ^ Although other network technologies exist, Ethernet (IEEE 802.3) and Wi-Fi (IEEE 802.11) have achieved near-ubiquity as LAN technologies since the mid-1990s. ^ "Physical Network Interface". Microsoft. January 7, 2009. ^ Posey, Brien M. (2006). "Networking Basics: Part 1 - Networking Hardware". Windowsnetworking.com. TechGenix Ltd. Retrieved 2012-06-09. ^ Jim O'Reilly (2014-01-22). "Will 2014 Be The Year Of 10 Gigabit Ethernet?". Network Computing. Retrieved 2015-04-29. ^ "Breaking Speed Limits with ASRock X99 WS-E/10G and Intel 10G BASE-T LANs". asrock.com. 24 November 2014. Retrieved 19 May 2015. ^ "Intel 82574 Gigabit Ethernet Controller Family Datasheet" (PDF). Intel. June 2014. p. 1. Retrieved November 16, 2014. ^ a b c d Tom Herbert; Willem de Bruijn (May 9, 2014). "Linux kernel documentation: Documentation/networking/scaling.txt". kernel.org. Retrieved November 16, 2014. ^ "Intel Ethernet Controller i210 Family Product Brief" (PDF). Intel. 2012. Retrieved November 16, 2014. ^ a b "Intel Look Inside: Intel Ethernet" (PDF). Intel. November 27, 2014. Retrieved March 26, 2015. ^ "Linux kernel documentation: Documentation/networking/ixgbe.txt". kernel.org. December 15, 2014. Retrieved March 26, 2015. ^ "Intel Ethernet Flow Director". Intel. February 16, 2015. Retrieved March 26, 2015. ^ "Introduction to Intel Ethernet Flow Director and Memcached Performance" (PDF). Intel. October 14, 2014. Retrieved October 11, 2015. ^ "Defending Network-Centric Systems using Backdoors" (PDF). ^ "Enhancing Scalability Through Network Interface Card Partitioning" (PDF). Dell. April 2011. Retrieved May 12, 2014. ^ Patrick Kutch; Brian Johnson; Greg Rose (September 2011). "An Introduction to Intel Flexible Port Partitioning Using SR-IOV Technology" (PDF). Intel. Retrieved September 24, 2015. ^ Jonathan Corbet (August 1, 2007). "Large receive offload". LWN.net. Retrieved May 2, 2015. ^ "High Performance Solutions for Cyber Security". New Wave Design & Verification. New Wave DV. ^ Timothy Prickett Morgan (2012-02-08). "Solarflare turns network adapters into servers: When a CPU just isn't fast enough". The Register. Retrieved 2014-05-08. ^ "OpenOnload". openonload.org. 2013-12-03. Retrieved 2014-05-08. ^ Steve Pope; David Riddoch (2008-03-21). "OpenOnload: A user-level network stack" (PDF). openonload.org. Retrieved 2014-05-08.